NEXT Bronze is the first in a suite of NEXT cards which include NEXT Design: Guarding the Net, NEXT Bronze, NEXT Silver & NEXT Gold. In a NEXT-based deck, installation & rez-ing of an instance of one of the NEXT ice buffs up all other installed & rezzed instances leading to ridiculous combos that get stronger and stronger as the game progresses. As a NEXT subtype of ice, NEXT Bronze is a natural fit with it's only slightly more costly friend NEXT Silver. Together when both rezzed throughout your servers, each of your NEXT Bronze will have an End the run. at strength of 6 and each NEXT Silver will have 6 X End the run. 's at strength of 1. Mother Goddess besides offering an End the run. it is kind of a stealth NEXT ice that if installed on a server with a NEXT-subtype ice, it gains that subtype as well further adding to the growing tally of NEXT ice installed. If you are keeping track that's now a total theoretical ceiling of 10 for each (since it's unique only one copy can be installed)NEXT instance throughout your servers! 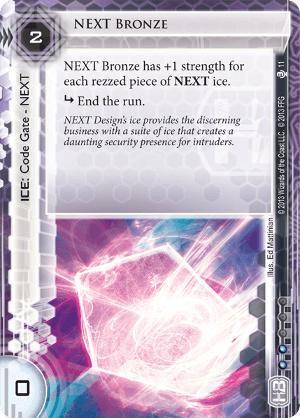 NEXT Design: Guarding the Net with enough NEXT ice in your deck, this ID could help get your NEXT synergy going right from turn 1. Accelerated Beta Test is commonly used with NEXT decks because of it's powerful ability more often than not of throwing more NEXT ice out there and giving a nice momentum boost to the runner. Architect, Jackson Howard Project Vitruvius and other recursion methods can be a very important answer to any ice trashing mischief the runner may throw at you. (Parasite being a significant threat to NEXT-based strategies. In combo with other NEXT ice NEXT Bronze can provide a formidably taxing End the run all while mutually buffing all other instances of NEXT ice. Strength grows throughout the game providing some counter-balance to the runner's growing capabilities.